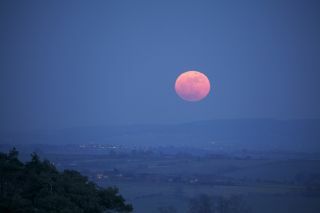 The full moon of March 19, 2011 - a so-called supermoon - rises over the villiage of Brill in the U.K. as seen by skywatcher Ian Griffin. This year's biggest full moon also gained notoriety after erroneous claims that it would spark waves of natural disasters around the world. NASA scientists and others dismissed the fringe lunar disaster claims as nonsense, but did admit the moon should look spectacular. Saturday's full moon appeared 14 percent larger and 30 percent brighter than the smallest full moons Earth sees, though the difference wasn't immediately apparent to some skywatchers. And for moon lovers graced with clear skies, that's exactly what happened according to overwhelming number of email reports received by SPACE.com from around the world. Skywatcher Tony Hoffman in New York City snapped this montage of photos as a plane crosses the disk of the full moon on March 19, 2011 during a so-called "supermoon." "It was beautiful as it rose, though it didn’t look particularly large to me, then again, I wasn’t expecting it to," I was fortunate enough to catch a jetliner’s passage in front of it," Hoffman told SPACE.com. "I don’t usually photograph the Moon when it’s so low, but tonight it paid off." Just outside New York City, in northern New Jersey, the bright moon offered a serene view for me and my family. We caught an amazing view of it low on the horizon, and then stopped at a hilltop vista to see the full moon with the lights and skyscrapers of Manhattan and Newark in the distance. Griffin wasn't the only one to send SPACE.com an account of a huge rising moon. In Grand Rapids, Mich., skywatcher Susan Wagener watched as the moon climbed up from behind the horizon, catching a stunning view of the so-called "moon illusion" in which the moon appears to be much larger near the horizon than it does overhead. "We watched the moon rise last night from our condo on the 23rd floor of Plaza Towers in downtown Grand Rapids, Michigan with our 4 1/2-year-old granddaughter, Matilyn Sizemore," Wagener told SPACE.com. "We talked about the moon and how it's different sizes during different times of the month and year. Matilyn's favorite moon is the half-moon she told us." "For reasons not fully understood by astronomers or psychologists, a low-hanging moon looks incredibly large when hovering near trees, buildings and other foreground objects," SPACE.com skywatching columnist Joe Rao explained in a recent column. "The fact that the moon will be much closer than usual this weekend will only serve to amplify this strange effect." Photographer Sandy Adams snapped this great view of the "supermoon" full moon of March 19, 2011 rising over Washington, D.C.
Omar Mendoza, of Hermosillo, Sonora in Mexico, snapped his version of the view to show a reddish-hue moon rising behind hills in the distance. "So beautiful, my moon," Mendoza told SPACE.com. This view of the "supermoon" full moon of March 19, 2011 was taken by skywatcher Abbe Arenson of Sanford, Fla. While SPACE.com received a flood of supermoon accounts, the theme was the same: an amazingly bright moon. While some skywatchers did not immediately notice the moon's larger size on Saturday night, they were all dazzled by its brightness. "That was sure a beautiful moon," said Abbe Arenson of Sanford, Fla. "The moon while bright and beautifully big, still did not seem larger upon rising (about 8 p.m.) than that night of January 19th when it rose. But as I just went outside, it is very definitely closer to the Earth - usually the moon by this time, 12:45 a.m., is very small up there." In Tasmania, Australia, observers Marlene and Tim B were worried that cloud cover would obscure their view of the moon. Those fears, it turned out, were unfounded. Marlene's photo shows a moon so bright it overwhelmed the frame. "What struck my husband and I was that it was difficult to look at. That is how bright it appeared. The glow that emanated from the moon surpassed any full moon that we have observed in a very long time," Marlene told SPACE.com in an email. "It appeared slightly larger; I suppose that was due to the close proximity of the Earth … it was absolutely entrancing. Who would have believed that you could take a picture at night, without using a flash, and get a picture of the moon like that!!!!!" The full moon of March 2011, as it appeared to skywatcher Dmtriy S. Benbau in Ekaterinburg, Russia March 19 during a so-called "supermoon." In Ekaterinburg Russia, photographer Dmitry Benbau took the opportunity to snap a close-up of the moon full disk. The bright and full moon, he said, was "very exciting." In Shallotte, North Carolina, photographer Tavi Greiner made the supermoon of March a family affair. Greiner's amazing photos show the moon low over the Shallotte River. "I took my entire family down to the river tonight, to experience tonight's 'Super Moon,' and was pleasantly surprised to see many of the locals out for a look, as well," Greiner told SPACE.com "It was really nice to see so many people looking up!" Editor's Note: SPACE.com received an overwhelming number of first-hand accounts and photos from readers who made stunning observations of the moon. While it is impossible to recount all of those experiences, you can see many of the photos in our Supermoon 2011 Photo Gallery, with more being added all the time.